Started on the box of Victrix Highlanders I bought back in April from Maelstrom Games. Today was the first time I actually took a close look at the contents. I ordered the Flank Company set, and the box and decal sheet is indeed this set. However, the actual parts are very odd and confusing. Some of the arms have only tufts on the shoulders - like center companies, and others have the correct wings for flank companies. In fact, the right and left arms for firing and other positions have one with tufts and one with wings. I sent an email to both Victrix and Maelstrom to see if this was a mistake, but I think this is how they are manufactured. I had planned to scalpel off the wings of some of them anyway for center company figures. I also had some left over arms from the earlier box of Victrix Peninsular Center Company guys so I just went ahead and put together what I could. I ended up having enough guys at shoulder arms for center company figures and the rest of the more active poses, to include firing, will be used for the flank company guys. I also used four of the Sergeant figures in the set since they have their muskets at shoulder arms too - on the right shoulder. Probably too many NCOs for this small unit, but for Sharp Practice they will not be Big Men anyway - and have muskets to add to the firing dice. There are a few figures left over, but I won't use them unless I get more shoulder armed parts. I plan to have them based four to a 40mm X 40mm stand. The guys in the front of the photo will be the grenadiers and lights. For Sharp Practice, I've used a stand of an officer with colors (both regimental and King's) and a musician. This stand is basically attached to a Big Man to relay commands - although they can also fight in Fisticuffs if needed. Taking a tip from another Victrix figure gamer, I added some Super Glue to the bayonets (near the join to the musket) for extra strength. We'll see if it works or not. These figures are really nice, and the faces and ostrich feathered bonnets are particularly well-sculpted. They'll go on temporary bases for painting next - black primer will be used for the undercoat. Adrian and I managed to pull off our Battle of Heraclea game this morning at Enfilade! 2010. This even though we never had the time to playtest it - we've played enough games together (WAB and others) that we knew what we had to do - almost instinctively. Oh, and Adrian is a veteran WAB-gamer too - so that helped a lot. 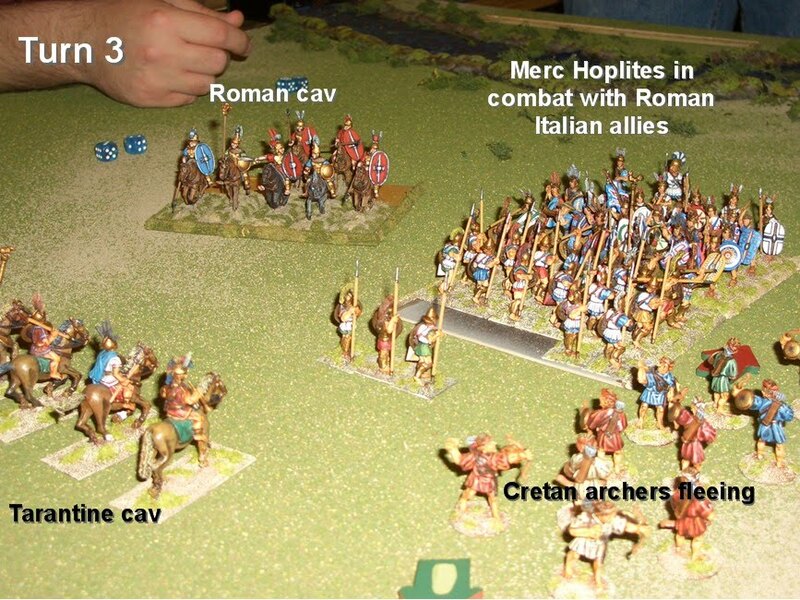 And I'm pretty comfortable with the rules too (at least version 1.5), as well as my Macedonian/Epirote army. Our armies were both about 3,000 points; decent sized for the four players (two-per side). Three of the four players are gaming buddies of ours and the other player was familiar with WAB. It was actually a fun game and I had to restrain myself at times to show how much I favored the Greeks. Well, Adrian admitted he was rooting for his Romans as well. I managed to snap some photos and have captioned them as best as I could recall. We agreed to call it at the end of Turn 5 - and it was decided to be a very close victory for the Epirotes - even Pyrrhic. 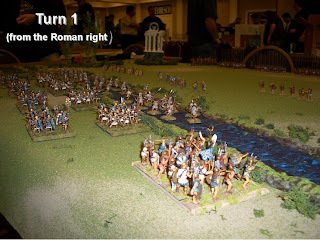 The Romans could well have recovered if they successfully rallied, but even then, it would've taken at least a turn or two for a clear victory on either side. All in all, I had a great time at Enfilade! 2010. The players from both the Sharp Practice game I hosted on Friday and today's WAB game were all seemingly happy. Myself, I'm even more convinced that I like both game systems and don't plan on dumping either anytime soon - if ever. 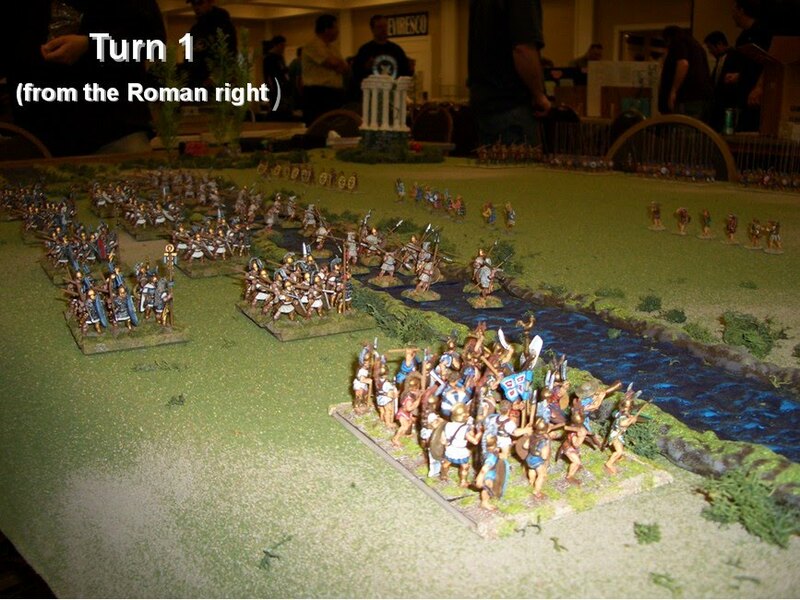 Here are a couple of pictures of the Boxer Rebellion game - the wall was scratch-built by Gene Anderson using foam core. It's a really excellent piece - and it really set off the game table. I also had to include a shot of my Japanese figures being well-run by a player who managed to get them scaling the Chinese walls - I think the only unit that made it. Great job! Here's the game I played in during the afternoon session - Bruce Smith's Going South using The Sword in Africa rules. He had 8 players and ran the game excellently.I ran a group of British South African Company that was tasked to scout the area for possible expansion. I ended up getting all my guys killed - some from Mahdists troops, some from Germans, and the majority from a mummy in the temple. Yes, a mummy! And one that can't be killed! Thanks a lot Bruce. I regret not taking a shot of the entire table - and showing the temple with it's marvelous top on. Bruce scratch-built this piece sometime ago - but it still looks great. Anyway, it was a really fun game and with a lot of action going on all around the table. Comparing TSATF (and variant) rules, I am still happy with Sharp Practice - mainly because of the use of Big Men. I think this scenario, or a similar one, could be easily adapted to Sharp Practice too. Well, tomorrow morning Adrian and I will host our Battle of Heraclea game and I hope I'll get some nice shots of the game to post. Well, it's late in the evening, and I'm relaxing with a St Pauli Girl Special Dark and ready to hit the sack for an early wake up for another round at Enfilade! 2010. But, before I do, I wanted to post a few pictures from the Sharp Practice game I hosted this afternoon. This was during the first period of the convention - starting at 2:00pm. Surprisingly, there were actually more folks wanting to play then the four slots planned - so I let two more folks in; total of six players. The nice game mat is Adrian's, who let me use it - quite an honor, as it is the first time being used. Adrian helped me co-host, but he hadn't played it in a long time and pretty much let me run the show. Half of the players either had a copy of the rules or played a somewhat similar Too Fat Lardies game - I Ain't Been Shot Mum! ; one player - Mitch B., actually ran the first Sharp Practice game I ever played at a previous convention. He hadn't played it in awhile too though. So, this sort of experience helped out in some ways, but in others, it led to a lot of questions - as I Ain't Been Shot Mum! does have a few differing mechanics. Add to that the Sharp's rules aren't the most detailed - so I had to make some on the spot rulings (which is why Game Masters get paid the big bucks :)! Anyways, here a few photos Adrian was kind enough to snap whilst I was knee deep in running the game. This was only my second time hosting a game at Enfilade, but being in the early period on the first day allowed it to be pretty low-key and low-stress. In fact, there were still a lot of great games going on. Right next to this table, a really nice Hundred Years War game using Crusader rules was being run by Chris C. I played a new board game with Adrian in the next period - Richard III. It's a pretty cool game, but I like pushing figures around better. Tomorrow, I hope to get in a few more games - actually pre-registered for a Colonial game in the afternoon. Sunday morning is another biggie - for me - co-hosting a WAB game with my Epirote army taking on Adrian's Republican Romans. I've had this guy for sometime now, but never had the motivation to paint him until now. Actually it's not so much motivation, but just something to do while waiting for this weekend's convention down in Olympia - Enfilade! He's on the big side, a little over 35mm to the top of his head. The sculpting is superb with intricate details like the patterned hem of the tunic and fancy greave. The lion's head is also very nicely detailed. I'll probably not get to the other mythological figures after Enfilade! - I may start on the Victrix Highlanders or Perry Hussars. This guy, like the Pan figure, was a quickie project. At least they're now painted - although I do need to finish Herk's base. I think this figure is from Miniature Giant - I won it off of ebay a few years ago and forgot who made it. I'll post the maker once I find out for sure. Anyway, I needed an Oracle for my Greek army and until I get a suitable figure - like the Foundry guy sacrificing a goat - this guy will have to do. He'll pretty much just be the marker where I'll put a D10 (or two) with the Oracle points that are rolled - and track it from there. I have a nice Hercules figure, as well as a Medusa and Centaur that need to be painted someday too. This is something actually built awhile ago, but I wanted to see how it would look with the Cretan Archers recently completed. 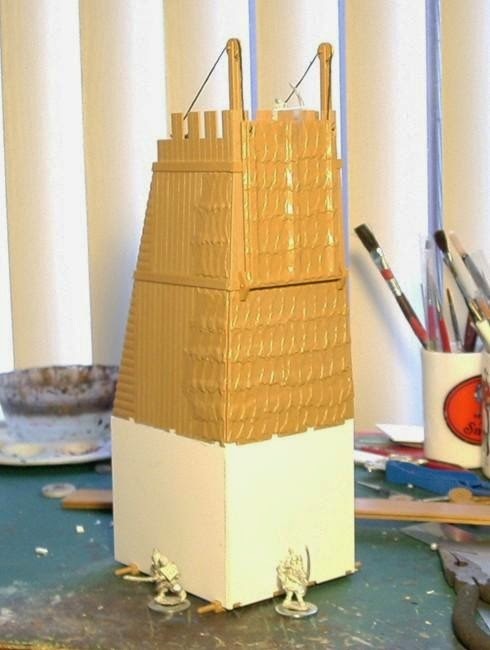 Here's how it looked prior to painting with plasticard added to the first level - which was scoured to look like wood grain. Some craft paper from Joann's applied to the front and painted like bronze was also added. A 1st Corps oxybeles is crammed in on the assault deck. Crusader Thureophoroi and Thracian Peltasts are also on the drawbridge ready to take an enemy city's walls. The gaping maw of the tower -the guys on the drawbridge are careful not to get in front of the oxybeles. The guts of the tower - a couple of Old Glory Hoplites want to get in on the action too. This tower would be a good size for most sieges, but a baby compared to the Helepolis or "Taker of Cities" used by Demetrius Poliorcetes. Some Baccus 6mm Macedonian Star decals are used on the small shields. These stars were also used on some Crusader Thureophoroi shields.The shields left mostly plain bronze may make them look more "mercenary." The camera angle doesn't help, but I have to admit the Old Glory hands and arms appear quite over-sized. However, this won't really be a problem as they'll be running around by themselves as skirmishers. A box of Perry French Hussars arrived in the mail today too. These were ordered (actually pre-ordered) from Maelstrom Games in the UK. What can I say, these look simply marvelous. Even if they are kit form, the pieces are minimal and the options are many - several headgear options, as well as campaign trousers or breeches and hessian boots - oh and the pelisses are separate too. Here are all the sprue trees - besides the one with bases. Also included is a beautiful illustration sheet of not only all the French regiments, but also the Prussian Death's Head Hussars and Hussar-guides d'Augereau. I think you could even get away with doing up early Chasseur a cheval too - leaving off the pelisse. Note - this is the reverse of the first side - starting with 7th Hussars. Looking forward to painting these up sometime after Enfilade - oh and not to forget the box of Victrix Highlanders too. 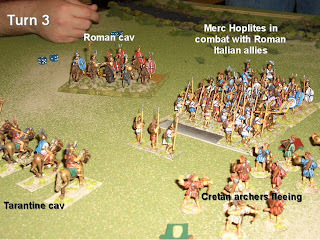 Thanks to a fellow member on The Miniatures Page I now have some Cretan Archers for my Epirote Army. I placed a "want ad" in the Marketplace on Monday, and they arrived yesterday! Wow! Anyway, I was able to start on them today. 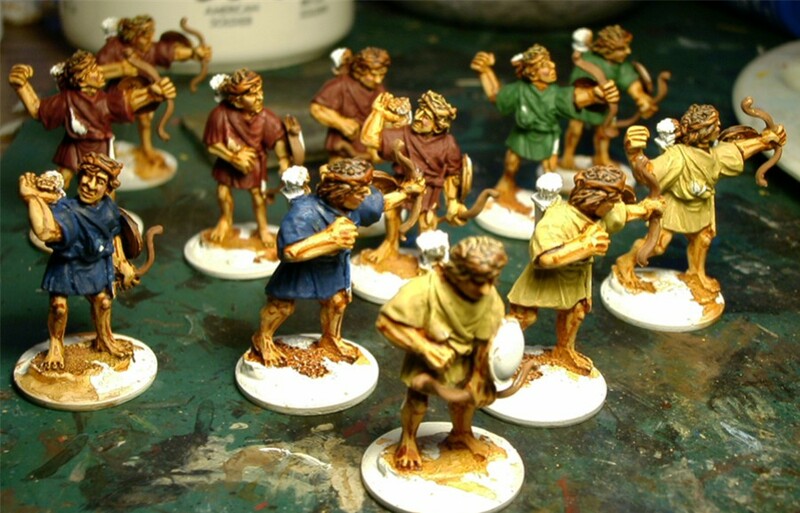 I like to use white as the base coat when there are a lot of flesh areas (as most Ancients are). The flesh base itself is a mix of Vallejo Medium Flesh and Foundation White. A wash of Vallejo Ink will be applied over this - the reason for the addition of the white is to compensate for the ink/stain effect. I'm only using 12 of the archers - on 3/4" (20mm) fender washers. My buddy is getting 15 of them for his soon-to-be realized Successor Army (I hope). I figure one good unit of these guys will suffice, if more missile guys are needed, I may add some slingers. I really like these figures - lots of character and great poses; I think their wavy hair is nicely-done too. Okay, the flesh and hair are done. The tunics are base coated too; the blues and greens will be toned down and muted once the highlights are added. The progress isn't too bad - considering I got my car's emission tested (after being stuck in traffic for about an hour), and registered. I also washed one of my dogs and the car too when I came home. Oh, and I later went out to lunch with my wife after her appointed at the hospital. All in all a fairly productive day. Time for a break and see what's on the idiot box. Added two more Front Rank Miniatures Spaniards for the Guerrilla unit - now a total of 12. This should be a good-size for this Poorly-rated group. They lose one firing dice per 5 figures. They are actually from Front Rank's Spanish Infantry range - and not actually Guerrillas. The one in the green jacket is a model belonging to the Catalonian Light Regiment; the blue-jacketed one is a regular infantry man in top-hat. I painted his cuffs in a light infantry style. It appears that many Guerrillas often times wore issued clothing mixed with civilian attire. Here's an out-of-doors shot of all 12 Front Rank figures for the Guerrillas group; they're forming up in front of the Old Glory Spanish-Style Church and Bell Tower.